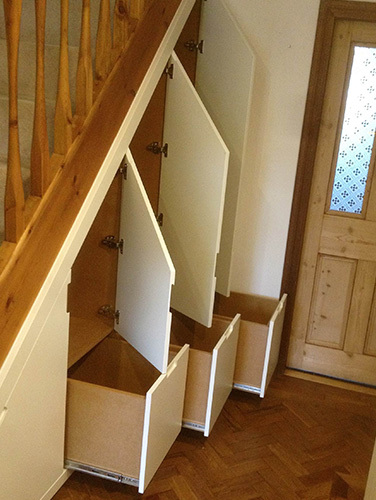 To design, manufacture and install bespoke under stairs storage units to compliment the oak staircase and rustic décor of the house. Careful measurement of the under stairs area and pitch of the stair case allowed us to design snug fitting angled doors and pull out drawers to maximise the storage space. The doors and drawers were finished with a soft, warm cream veneer. The customer was dlighted, not only with the storage space, but with the beautiful sleek and subtle look of the doors and drawers. 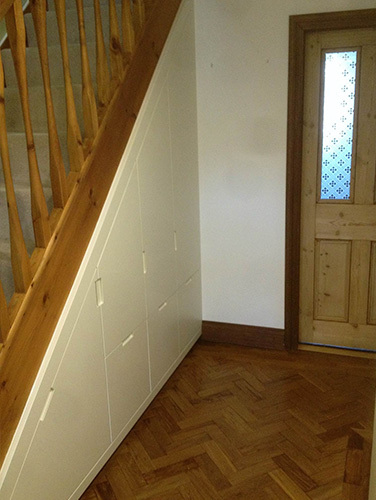 “Onyx provided excellent customer service and their joinery skills are excellent. The storage fits perfectly and has a top quality finish which compliments my classic home design perfectly.” – Mrs W of Hinckley.